The duration between my trips to the US keeps getting shorter! I have set a new personal record with just two weeks between my trip to Orlando and this one. BTW, the US has (finally) begun introducing exit procedures when you leave the country. In San Francisco airport, there are now automated machines where you can scan your visa/passport to record your exit. 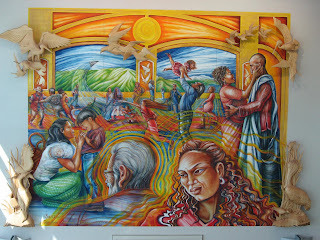 While awaiting the departure of my flight to Singapore, I noticed some wonderful murals in the new (?) Terminal G of San Francisco International Airport. The first one is by Juana Alicia and Emmanuel Catarino Montoya called Sanctuary depicting the arrival of immigrants and drawing similarities with migrating birds. The mural is painted in Fresco Buono, an ancient technique that mixes pigment directly into wet plaster. 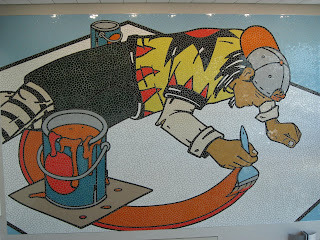 The second is a ceramic tile mosiac by Rigo, called Thinking by Balmy Alley, of a solitary boy totally absorbed in the art of painting, and is inspired by a mural (since destroyed) painted in 1993 by the artist and local youth in Balmy Alley, located in the mission district of San Francisco. I had six hours to kill at Singapore Airport which gave me enough time to write up most of these blog entries in the lounge, take a shower, and enjoy some Chwee Kueh and hot wonton noodle soup, before taking the flight to Mumbai. San Francisco is one of the prettiest cities in the USA. I love watching the traffic disappearing over the hilly horizon, the tram-cars that remind me of Calcutta, streets with Spanish and Victorian houses, the Golden Gate shining in the sunlight, the downtown area filled with many dining and shopping options, the hustle-and-bustle of Chinatown, and of course the people. I have been here many times before, but I still like visiting here. 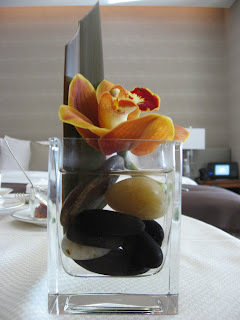 The picture alongside is that of a decorative vase in my hotel room. My room on the 12th floor had a great view of the downtown area; the Metreon multiplex and Bloomingdale shopping complex are only two blocks away and I could see the distant hills with houses and roads winding up and down in the distance. 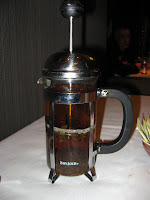 On the last night of my stay here, I ate at the Ame, the Regis' signature restaurant at the lobby level. Ame combines elements of fine Japanese and Western cooking. 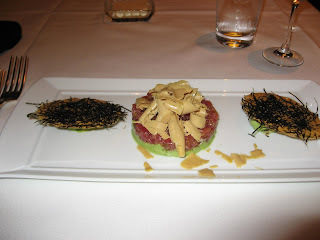 I ordered chilled sake and started with Tuna Sashimi with avocado tartare, shaved sake cured foie gras and nori tuile. For my entree, I ordered the chef's special for tonight that consisted of honey glazed rabbit with snow peas, spinach ravioli, dusted with goat cheese. 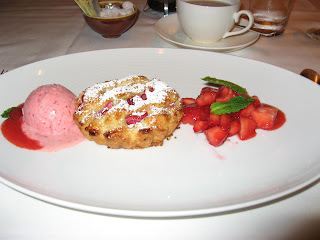 And for dessert I went with the waiter's recommendation of a warm rhubarb pie with fresh strawberry salad and ice-cream, followed by freshly brewed Earl Grey tea. Ame is run by husband and wife chefs, Hiro Sone and Lissa Doumani. You can find more details of this wonderful restaurant and the menu here. The pictures in this posting are of the sashimi, the dessert and the unique teapot in which the tea was brewed and served. After this awesome dinner, it was time to pack up for my long trip back home the next day. The team dinner this time was in an upscale French restaurant. 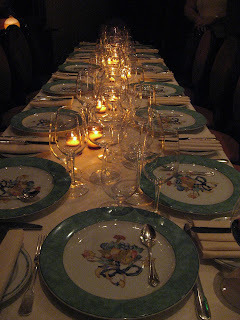 The Fleur de Lys is said to be one of the best restaurants for fine dining in San Francisco. This 45 year old restaurant has won many awards, as has its celebrity chef, Hubert Keller, who also owns this restaurant. Keller has been a guest chef to the Clinton White House, and the author of more than one cookbook. We started with a tasting platter of Alsation Choucroute consisting of Choucroute soup, toasted spatzle, paprika oil Choucroute fondant with Osetra caviar and Choucroute strudel with sauteed foie gras. This was followed by saddle and chops of rabbit with bean salad, carmelized cumin seed, honey and mint vinaigrette. 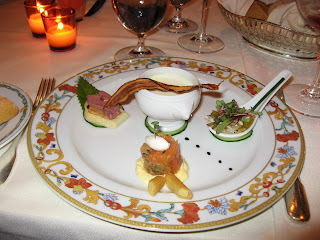 Then came the symphony of smoked salmon tartar, chilled cream of salsify, Tartine of foie gras, duck breast and salad Lyonnaise. For my entree I chose the boneless Quail stuffed with ris de veau presented with roasted parsnips, young leeks and foie gras, lightly smoked Tarragon jus. Dessert was equally grand with peanut and chocolate pot de cream, chocolate mousse cake flavored with lemon herbal tea, chocolate and strawberry feuilletine, Vanilla bean ice-cream and orange terrine. Whew! I bet it will take you a dictionary or heavy use of Google to figure out what I ate unless you are French. For those who are wondering what Fleur de Lys means, it is a stylised, decorative flower symbol associated with the French monarchy and is still used in many logos and banners. 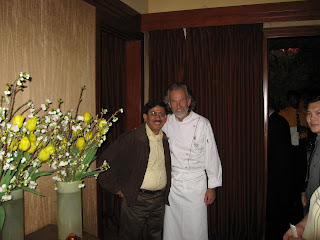 And finally, here's a picture of yours truely with the celebrity chef himself! 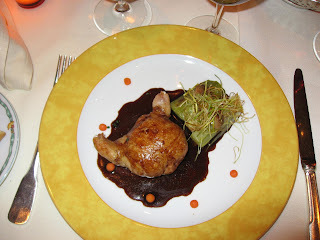 UPDATE: You can read about a more recent visit to Fleur de Lys here. Unpretentious, superior hospitality, and cosy restaurants. That, in a nutshell, is how I would describe the Le Royal Meridian Hotel in Mumbai. I spent exactly four hours here before taking the Singapore Air flight on my way to San Francisco. 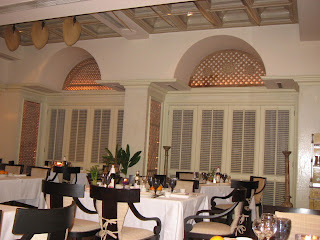 The hotel is located behind Hyatt Regency and ITC Grand Maratha, and is very close to Mumbai's International Airport. 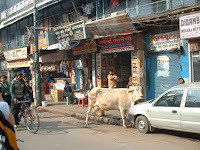 The hotel is not large and lavish like most five-star hotels in India. However, the lounge area on the same level, surrounded by the Chinese and multi-cuisine restaurants are done up rather nicely with white drapes and chandeliers. The live music during the evenings livens up the atmosphere considerably. I ate at the Imperial China which had Oriental fans swaying to-and-fro in the ceiling; never seen that before! The prawns in black pepper sauce was delicious; however, the chilly-garlic rice was nothing to write about. I finished off with rose-petal ice-cream, which was rather nice and reminded me about childhood indulgence of home-made rose-flavored sweet dishes. What stood out during the few hours I spent here was the great service by the hotel staff. The moment I got off the car, one of the staff greeted me by name, escorted me directly to my room and handed me my room keys, etc. 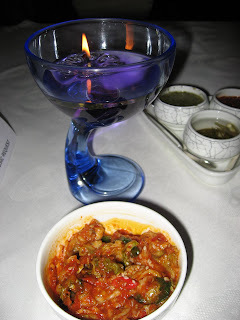 The bellboys and front-desk staff were very courteous, as was the waitress at the restaurant, offering me complimentary kimchi and starters while I was waiting for my order, and magazines to read. Definitely a notch higher than the service levels at most hotels I visit; almost Oberoi quality! Is is any surprise that Singapore Airlines almost always bags the Best Airline awards everywhere? They not only have a very modern fleet and a great airport in Changi, but also manage to keep their prices competitive. 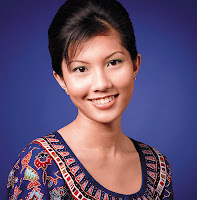 The Singapore Girl is often cited as yet another reason for travelling on this airline! While most travellers equate the Singapore Girl to pretty attendants on the flights, it is serious business for the airline which has used the 'Singapore Girl' as one of its most successful brand icons. French haute-couture designer Pierre Balmain designed a special version of the Malay sarong kebaya as the uniform which later became one of the most recognized signatures of the airline. The icon has become so strong that Madame Tussaud's Museum in London started to display the Singapore Girl in 1994 as the first commercial figure ever. 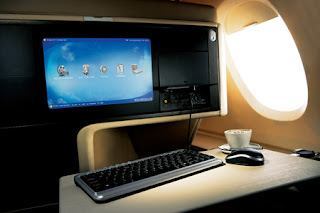 And now there is another reason to look forward to travelling by Singapore Airlines: the newly designed cabins that have been introduced on routes serviced by their newly acquired Boeing 777-300ER jets. Here are some pics of their new business class cabins (seats in 1-2-1 configuration). 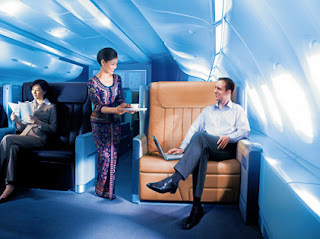 An excellent article on Singapore Airlines and how they built one of the most successful Asian brands can be found here. Delta used to be my favourite airline. Their BusinessElite seating was one of the best some years back. I thought they had the best Frequent Flyer program and also the best selection of wines. 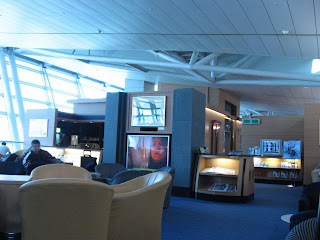 Their lounges are among the best I have seen in the USA (of course, they are still way behind if you compare the local airline lounges in Singapore and Hong Kong). But times have changed. While the Asian airlines thrive and keep upgrading cabins and service-offerings every year, the large US airlines (United, Delta, Continental, Northwest) have been trying to stay afloat. The last six months seem to have been good and profitable; however, I think they still have a long way to go before they can compete with the Asian airline companies. Here's an article from USA Today that discusses the troubling signs. The average age of planes owned by the big four American airlines varies between 17-11 years! The problem is, even if the US airlines find money to upgrade their fleet, the only two suppliers of airplanes - Boeing and Airbus - have an order backlog all the way to 2010. And guess who's been ordering planes by the dozen all this time:the burgeoning airlines in India, China, Middle-East and Far-East Asia. I flew to Orlando and back with my family on Delta with mixed feelings knowing I may not fly with them again any time soon. BTW, when you fly business on Delta, they usually put you on First Class in the local US connections; I don't know of other airlines that do this. On the negative side, most Delta flights from India connect via Paris, which is probably the worst airport in Europe! Since we visited the theme parks only on three days during this trip, we had a couple of days to laze around in the resort. 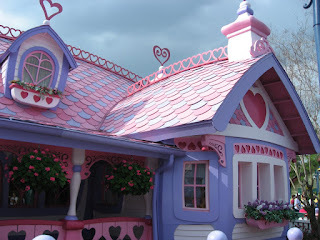 During these 'lazy' days, we would take the bus to Downtown Disney during lunch. 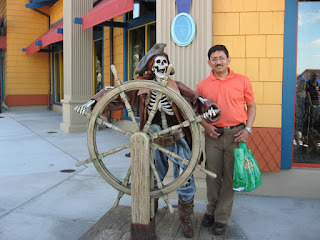 Downtown Disney has a variety of shopping, entertainment and dining options arranged around a lake. A huge Virgin store for all the movies and music you want to buy, an AMC 24-screen multiplex, a Cirque du Soleil theater playing La Nouba, and the largest Disney shop in the world for Disney toys & clothing. It's all here in Downtown Disney along with night clubs in Pleasure Island which requires entry tickets. 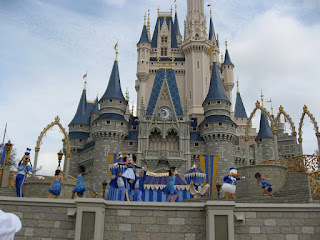 This is the only Disney location which seems to have something for the adults to do after being surrounded by Mickey, Donald and their pals in the theme parks! 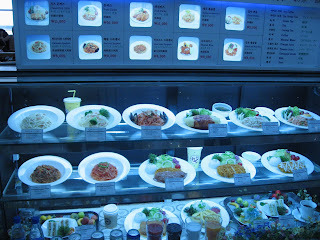 However, what drew me here were the many dining choices. 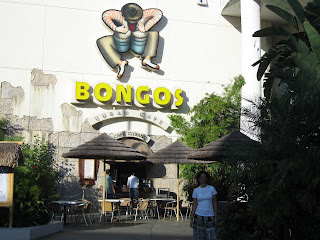 Bongo's serves Cuban food and is owned by Gloria Estefan and her husband. 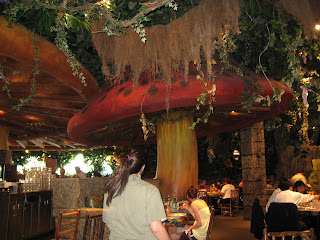 Other options are the House of Blues, Planet Hollywood, Wolfgang Puck, and the volcano-spewing Rainforest Cafe. 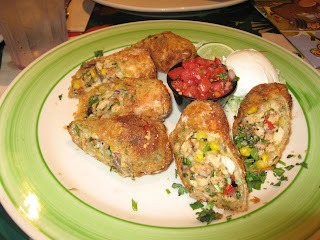 Here are some pictures of the rather interesting fare we sampled at the Rainforest Cafe. The Chimi Cha-Cha is a starter; light, crisp wonton skin embraces roasted chicken breast, sweet corn, black beans, citrus zest,roasted red peppers, and a 4 -cheese blend. 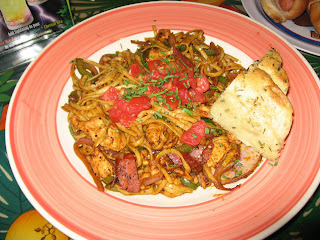 The Pastalaya, an entree, is made of shrimp, sauteed chicken breast, bell peppers, onions and Andouille sausage tossed in a hot and spicy Cajun sauce and served over linguini. Of course, the most interesting thing in this eatery is the ambience: vines and trees all over the place, animals that move and make threatening noises accompanied by periodic thunder and lightning. 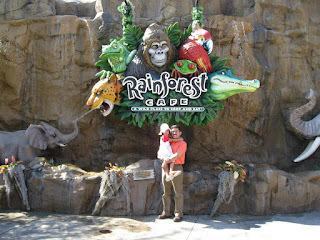 My little angel felt threatened by the ugly-looking gorilla right above our table which would grunt and beat his chest every few minutes. Bad gorilla! 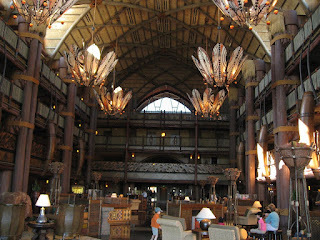 I had written earlier about Disney's Animal Kingdom Lodge here. 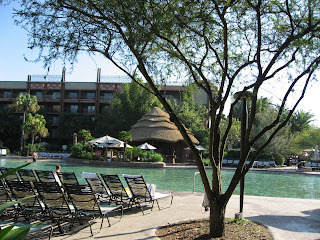 This resort is probably Disney's best 'deluxe' resort and also one of its newer ones. 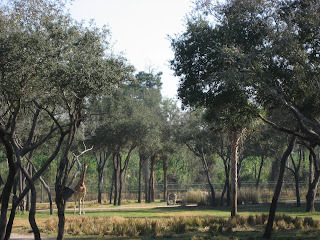 I had booked a Savannah facing room and we would occasionally see giraffes, zebra, pelicans, deer and other African animals right from our balcony. 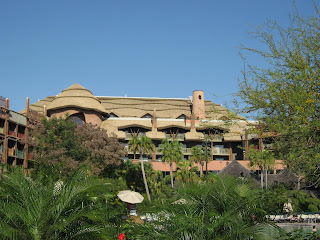 Everything here is designed to contribute to the 'being in Africa' feeling: the staff from African countries (or cast members as Disney prefers to call them) , real African artifacts, the low lighting in the rooms and corridors, the furniture, the African drum-beats heard in the corridors, the greenish colored swimming pool, the thatched roofs on the hotel, and of course the large Savannah that surrounds the property. The main hall is awe-inspiring (click picture to view a larger sized one) and appears to be constructed of logs held together by ropes and with a thatched roof. This feeling is reinforced by the detailing that includes chandeliers made of tribal shields and spears. A massive fireplace is placed in one corner, with large windows looking out into the Savannah. There are multiple activities conducted by the rangers for kids during the day at the Arusha Rock viewing area, the flamingo pond, and at the Sunset Lounge. But what did I like the best? As you can guess, it was the food! The African Kingdom has three dining options: The Jiko serves contemporary African food and stocks over 70 African wines, the Boma serves buffet in a market-place setting, and Mara for quick-service options. Both Jiko and Boma have won recent awards; Zagat Survey recently rated them among the top five restaurants in the city. 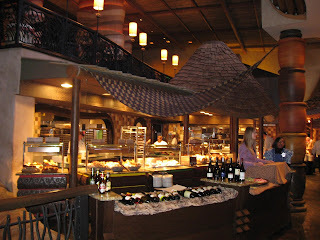 Both breakfast and dinner buffets at the Boma were a treat for the senses. The ambience, the presentation, and the quality of food and drinks served are excellent. There were about 60 items in the dinner buffet and I can remember Marakkesh Cous Cous, Fufu, Pap & Sheeba, Sharaak, exotic salads made of orange with raddish and watermelon rind. 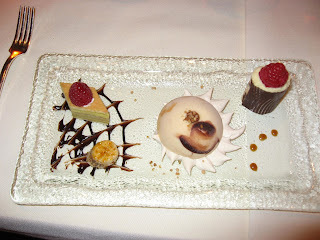 Dessert choices that included peach crumble, zebra domes, fruit tartlets, chai flavored kheer, etc. For breakfast I usually had their jungle juice, made-to-order omelettes (mine usually had ham, cheese, mushroom, and onion), french toast, banana nut muffin, sausages, bacan, baked potatoes, and fresh fruit. Oh yes! I was having fun. I can also say that Boma makes some of the best omelettes I have ever eaten. BTW, why can't they make muffins in India? I miss my banana-nut and blueberry muffins!